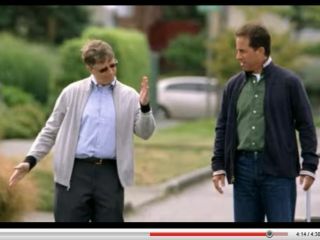 Microsoft's second 'Seinfeld' advert: sly postmodern nod, or car crash TV? For the first Seinfeld/Gates advert we used just three letters to sum it up: WTF. Now, for the second, we use another three: hmm. In the second instalment of Microsoft's multi-million dollar campaign, titled 'New Family' we see the terrible twosome connect with the people of the US, by staying in a family's house for a few days. Granted this 'episode' is funnier than the last, with the camaraderie between the pair more natural and not forced like it was in the 'shoe store' skit. And you do get to see Mr Gates 'do the robot' at the end of the ad. It will be interesting to see the reaction to this advert, as the campaign did not get off to a good start, mainly due to people not getting it. The advert has divided TechRadar right down the middle, with Patrick Goss, Editor (News), commenting: "Microsoft has got an image problem, and while the advert isn't selling a particular product it's doing a good job of softening the overall brand." On the other hand Gareth Beavis, News Writer, believes that the whole campaign has failed with its message. "As a sketch it doesn't work, it's far too egotistical," say Beavis. "It tries too hard to be funny and ultimately belittles both the people in it."